Yesterday I touched upon the 20th anniversary collection for Kirby in a review. Today I am going to delve into the 10th anniversary package for Sony and Insomniac's Ratchet & Clank series. The lombax and robot pair have seen better days (looking at All 4 One and Full Frontal Assault's disappointing beta), but at least we can still enjoy the pair's past successes. Here is my review. It's an amalgamation of anniversaries this year in gaming. Final Fantasy is enjoying its 25th, Mega Man is powering up for his 25th (despite Capcom's gross disinterest), Kirby is celebrating his 20th, and the subject of this review, Ratchet & Clank are ten years strong. Yes, it was ten years ago that a precocious pair (and an unlikely one at that), a lombax named Ratchet and a robot named Clank, teamed up together to thwart the plans of Chairman Drek. 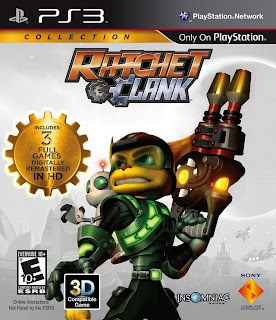 The series would go on to span three sequels on the PlayStation 2, two titles on the PSP (Size Matters and Secret Agent Clank), and five original games on the PlayStation 3 (with the upcoming Full Frontal Assault being the fifth). 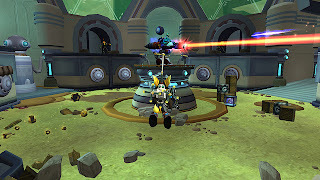 To commemorate the 10th anniversary occasion (it is the gold bolt anniversary, you know), Sony assigned developer Idol Minds to craft a collection of Ratchet and Clank's greatest adventures in Ratchet & Clank Collection. Should fans who have already traversed Planet Veldin, Pokitaru, Hoven, Endako, and Oozla on countless occasions take the time to pick up this trilogy of some of Ratchet and Clank's finest action-platforming romps? And what about newcomers? Should they, too, get ready to lock and load? The Ratchet & Clank Collection contains the three most popular PlayStation 2 games: the original Ratchet & Clank, Ratchet & Clank: Going Commando (known as Locked and Loaded in Europe), and Ratchet & Clank: Up Your Arsenal. Each game brought with it something new to the table to entice players, along with the franchise's trademark sense of quirky humor. The series itself is a combination of traditional 3D platforming and run and gun shooting. Along the way there are loads of entertaining mini-games to participate in. These can be as simple as gadget games to open locked doors or as intricate as hoverboard racing and ship combat. Going back to shooting, the series is known for its innovative and awesome weaponry. Who wouldn't want to set off a Mini Nuke onto foes or turn intimidating baddies into adorable sheep? Outside of weapons is a gaggle of gadgets Ratchet employs including the always trusty Swingshot, the water freezing and thawing Themanator, and the platform-summoning Dynamo. Smile for the camera, everybody! 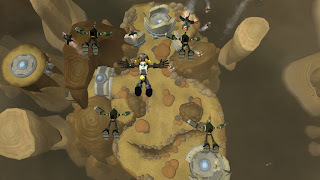 The game that started it all, 2002's Ratchet & Clank, introduced the world to a fix-it wizard Ratchet and and an intelligent, if not naive, robot named Clank. The two did not immediately hit it off. In fact, Ratchet did not originally even care about the galaxy being in peril. I mean, who would care about a corporate despot who takes pieces of planets around the galaxy to build his own greed? The two would eventually settle their differences and become the powerful pair that fans know and love. 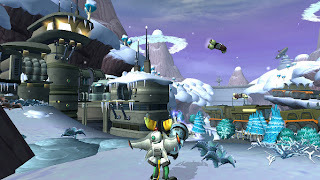 Unlike every other traditional Ratchet & Clank title, this first game does not have upgradeable weapons through the standard means of continued use. Instead, gold versions of weapons can be purchased via Gold Bolts (which I consider to be the hardest-to-find items in any Ratchet & Clank game) and a certain amount of regular bolts, the currency of the series. Going between the first Ratchet & Clank and then playing Ratchet & Clank: Going Commando is sort of like being in a pitch black room for an extended period of time and then turning the light on. It's night and day. The franchise's controls evolved and feel much better and less clunky. In fact, the whole series evolved with Going Commando. Now, Ratchet's weaponry could increase in power and function after repeated use, encouraging players to not just rely on one weapon but to spread the love (and the pain to enemies). Along with leveling up weapons, Ratchet could improve his Nanotech (health) by slaying countless enemies and finding hidden upgrades as well as get armor upgrades. Then there is the godsend of being able to strafe, making difficult encounters less daunting and tasking to the player. Oh, and the ability to smash the ground with Ratchet's wrench, breaking all boxes around the loveable lombax. If you've ever had to do the time-consuming task of breaking each box or series of boxes individually, you'll know how much of a savior this unlockable feature really is. Finally, the Challenge Mode from Ratchet & Clank returns, but this time players can get a bolt multiplier through defeating many enemies without taking damage. From the pitch perfect pacing to the excellently designed levels to the humorous story of manufactured pets threatening the galaxy, Going Commando feels like the most complete and the most satisfying Ratchet & Clank game. It is at the top of my list, not just in the Ratchet series, but the PlayStation 2 generation as a whole. ...To platforming perfection in Going Commando. The final game of the collection, Ratchet & Clank: Up Your Arsenal, debuted a long-running villain in the series, the... nefarious Dr. Nefarious. Alongside his butler Lawrence, the sinister doctor wishes to end the reign of the "squishies" by turning everyone into a robot. This is all the while having the occasional slip into broadcasting a soap opera. (Trivia: The voice actor behind Dr. Nefarious, Armin Shimerman, went onto voice Andrew Ryan in Bioshock.) Regardless, Up Your Arsenal focused a little more heavily on the combat aspect of the series rather than platforming. But don't get me wrong -- there's still plenty of the latter to be had. It is just the game seems to have been a prelude to Deadlocked, one of the black sheep of the series. 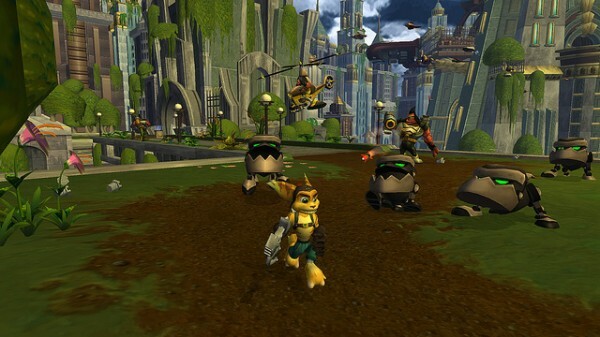 There are several sections in the game where Ratchet is let loose on a battlefield, commandeering vehicles, and fighting off wave after wave of enemies. 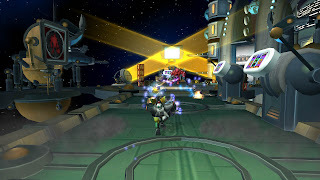 Up Your Arsenal also has one of my favorite mini-games in the series, a 2D platformer starring Captain Qwark, telling the story of the franchise in his decidedly polluted and biased viewpoint. Up Your Arsenal was the first Ratchet & Clank game to include a multiplayer component. Just like the original PlayStation 2 release, this PS3 version supports online play as well with modes like Deathmatch, Capture the Flag, and Siege (players storm or protect a base). These modes remain as fun as they were when they debuted in 2004, though nothing groundbreaking by any means. 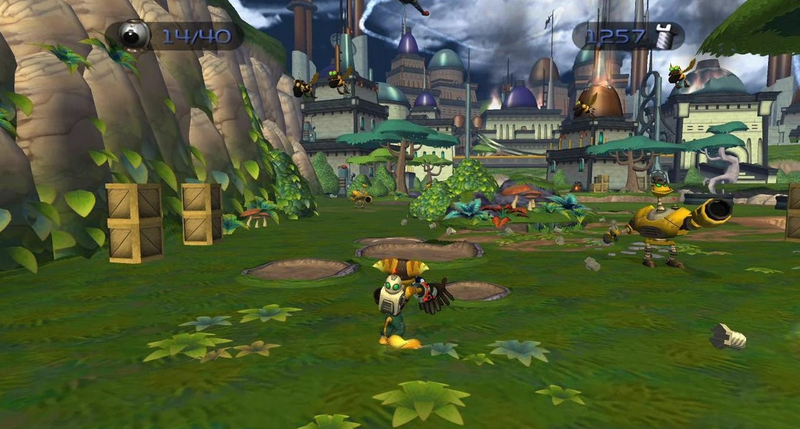 All three of the main PlayStation 2 Ratchet & Clank games have been remastered -- all are in 1080p HD resolution and contain the capabilities for 3D play. The framerate of each game has been bumped up and set to a steady 60 frames per second, whereas in 3D the framerate is only 30 FPS. The decision to go with 60 or 30 all depends on whether you prefer a very smooth or a very stereoscopic visual experience. In addition to graphical and technical improvements, all three games support trophy functionality, each giving the player a platinum for obtaining all trophies. Most trophies are tied to getting skill points, earning a certain amount of bolts, finding all special bolts, buying every weapon, leveling up all weapons, and story-related accomplishments. The games by themselves take anywhere between 8-10 hours to beat the first time around, but to obtain every trophy for a given game will last you up to 25-30 hours. You will definitely get your bolts' worth. is called Up Your Arsenal. However, not all is well with the presentation, content, and tech of the game. For one, the main menu of the game is unremarkable and just lazy. There is the choice to select between the trio of titles and no other interactivity. The only thing to accompany you is an orange and yellow screen with videos of the series playing in the bottom left corner. But that is passable and not much of a bother. What is a bother is when I press the Home button during a movie and after the clip is over it repeats for some odd reason. There is also stuttering and visual hiccups within said movies that I don't remember being in the original games. There were also times when the game just crashed on me, forcing me to hard reset my PlayStation 3. These unpolished moments do not pop up often, but when they do, they are spectacularly off-putting. Ratchet & Clank Collection is a phenomenal deal. Last generation, each Ratchet & Clank game would run you fifty dollars, and those were in standard definition only with varying framerates. In the incredibly commendable collection, you are getting remastered high-definition versions of the intergalactic duo's three best PlayStation 2 games for essentially ten bucks a piece. That is one heck of a steal. Not even Gadgetron's vendors could give you a better deal. The collection isn't perfect as there are some atypical freezing and stuttering issues, but for thirty dollars, no Ratchet & Clank fan should do without this collection in their library. If you're a platforming fan, you can enjoy a genre that has been tremendously sparse on HD consoles. Grab a handful of bolts and head to your local game retailer. This collection is golden.